Way back at BlizzCon, during the World of Warcraft Q&A hosted by Wowhead’s Panser, a question about the future of pet battles was asked. 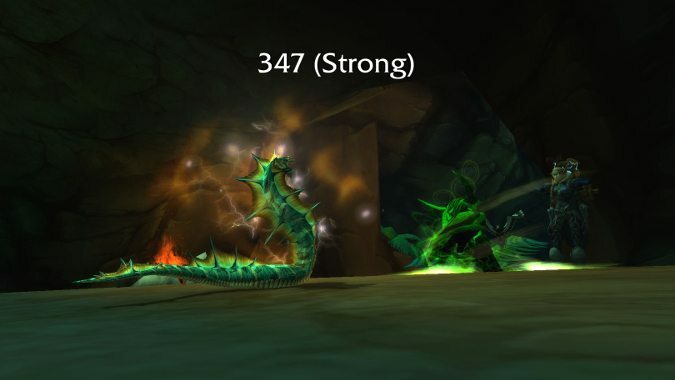 The answer was a pithy yet cryptic “pet battle dungeons.” When the patch 7.2 PTR hit, the blanks were filled in quite suddenly, as the first pet battle dungeon is available to be tested. You can start off your adventure by visiting Serr’ah or Lio the Lioness in Breanni’s pet shop in Dalaran. 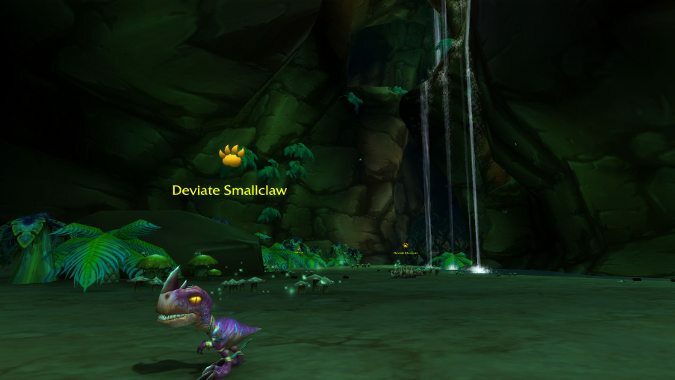 A Call From The Caverns likely becomes available once you have a minimum of three level 25 pets, but due to the size of my stable I can’t confirm. You’ll go just outside Wailing Caverns, where you’ll queue up for the dungeon from an NPC. It’s a scenario, similar to the Celestial Tournament. The pet battle dungeon itself is a version of Wailing Caverns. There are a few deviate pets you’ll encounter repeatedly as the sort-of “trash” of this dungeon. The Aquatic Deviate Chomper, Flying Deviate Flapper and Beast Deviate Smallclaw pop up repeatedly throughout the dungeon. You’ll have to defeat three teams to progress to the first boss. They show up again in later trash phases. In each phase, the extra pets jumping into these encounters are locked after you start battling, so if you choose a team which isn’t the best against the specific three you draw you can forfeit and try again with better counters. There are a total of three bosses and three trash phases to defeat in the dungeon, all reminiscent of the original Wailing Caverns. The pets you’ll be facing have either the Elite or Boss buffs, so the battles are a bit tougher — and definitely lengthier — than regular wild fights. I had a few false starts my first try, mostly due to shields or reflexive damage hampering my favorite DoT-style team comp. 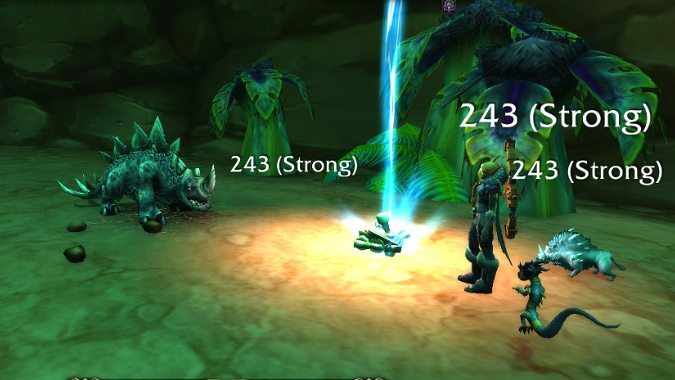 Aside from shields, the battles were mostly simple rock-beats-paper family interactions, especially since you can heal and revive your pets if you mess up. For completing the pet battle dungeon, you’ll get a level 25 pet stone and a new challenge. Damp Pet Supplies from completing the challenge contains the usual pet junk — bandages, charms, and the like — plus a chance at one of three new pets. The Everliving Spore, Cavern Moccasin, and Young Venomfang all look like decent pets, though of course the real prize is bragging rights. The challenge is where things get interesting. You’ll have to repeat the dungeon, only without using your out-of-combat heal or bandages. If you’re going to attempt the challenge, I have two major recommendations. First, I’d recommend you bulk up the Mechanical, Flying, and Dragonkin parts of your stable. The trash battles aren’t tough per se but they are longer than usual because of that elite buff, so you’re going to run through more pets than you usually would for wild battles. There’s also the possibility you’ll get unlucky and have a streak of one trash pet to run through the relevant part of your stable. Secondly, make sure you use a pet you don’t care about to face check your wild opponents. At this time, fleeing the non-boss battles give the same 10% HP hit as any wild fight. Unless your stable is ridiculously packed, it’s well worth your time to use a dummy team to test the waters. It took me roughly 45 minutes to complete the dungeon my first time through. It seems the challenge can be repeated on a weekly basis, giving you lots of chances for that bag. My one big criticism is, though it’s a fun and dynamic challenge now, I can see myself getting bored quickly due to repetition. Given the dynamic fun of Family Familiar, repeating the same handful of fights until I get all the stuff I want seems like a step back. Even the Celestial Tournament had a rotation to it. There’s a bit of mystery surrounding the dungeon, but you’ll see that when you get there. I’m hoping this is just the first of many pet dungeons to come.